MTHFR: You might read that and think, “Anne, don’t swear!” but actually, the MTHFR gene mutation affects about 30-50% of people. Before you get freaked out by the word “mutation”, let me explain. If you don’t care about the science, you can skip the next couple of paragraphs. However, I believe that when we understand the science, we can take more control over our health. Let’s start with the basics. Your body’s processes are run by your genetic code, which is made up of billions of unique copies of DNA. Even though you inherit this genetic code from your parents, your DNA still changes throughout your entire life. Basically, your DNA is like a manuscript that isn’t finished. Mutations happen when a single unit in the sequence is altered, and these alterations happen constantly. While they can occur from external damage (something in your environment triggers it), these mutations can also just be simply be a mistake. Every time a cell divides to create more cells, it makes a copy of it’s DNA. Naturally, mistakes are made during this copy process. Most of these mistakes are corrected by the cell’s “copy editors”, while others are trivial and go completely unnoticed. Occasionally, one of these mutations doesn’t get corrected, and it passes from cell to cell. Eventually, this mutation can even pass on to your offspring. This happens when the MTHFR gene is mutated. On the spectrum of genetic mutations it’s fairly mild, but it can certainly make you feel less than your best. MTHFR contains the code that helps your body make methyl-folate from folate-containing foods. 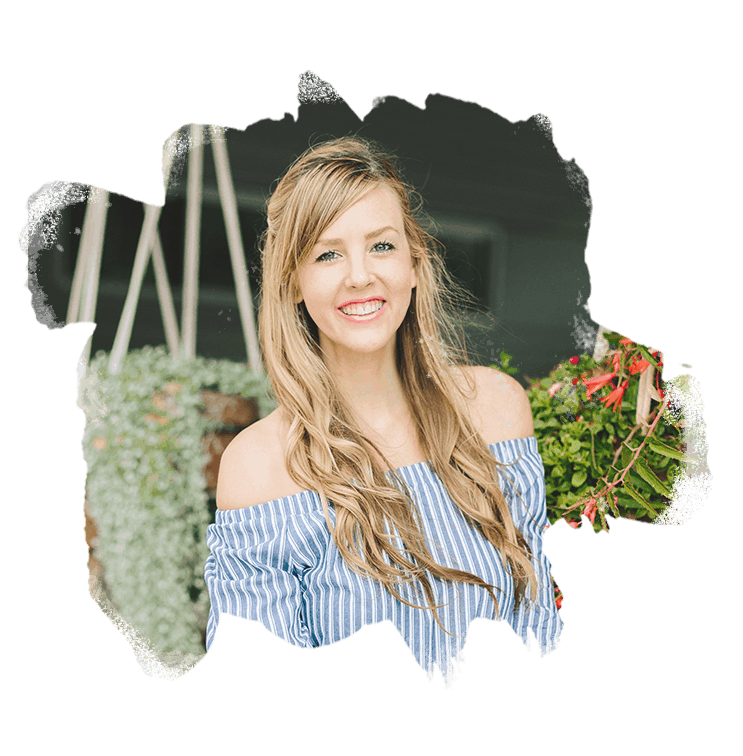 This nutrient helps your body complete a variety of different processes, including metabolizing key nutrients and detoxifying, which is essential in keeping our bodies up and running optimally. 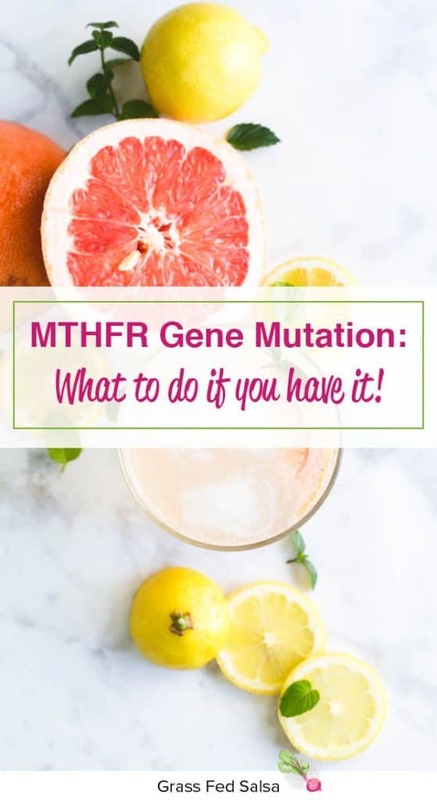 How do I know if I have the MTHFR mutation? While there are non-specific symptoms that can indicate having the mutation, there isn’t a definitive list that will tell you if have it. My recommendation: anyone who has been working on healing health issues yet hasn’t had much success – get tested. There are several companies that do genetic testing, I recommend asking your primary care doctor to test for you (through DNA Life), and using Strategene to analyze your results. Genetic snps are not easy to understand, and the average primary care physician won’t know what they mean (or even how to interpret your results!). Strategene not only tells you your genetic makeup (aka any gene mutations like MTHFR), but they give you personalized recommendations on optimizing your lifestyle to support your genetic mutations. Your doctor can also check for signs of MTHFR gene mutation by testing your homocysteine levels. This is often covered by insurance, but is not 100% conclusive. You have also likely heard of 23 & Me, but they were recently bought by a large pharmaceutical company. I would be cautious about providing them or any genetic testing company unless very specifically recommended with personal information like your DNA. What does that even mean if you have MTHFR? If you come to find out you do have the MTHFR gene mutation, step 1: DON’T PANIC. Deep breath, in…. and out…. Now, the best place to start is by working with a practitioner who is knowledgeable about MTHFR. Again, this likely will not be your primary care physician. An educated practitioner will be able to help you figure out how MTHFR fits into the issues you are dealing with. 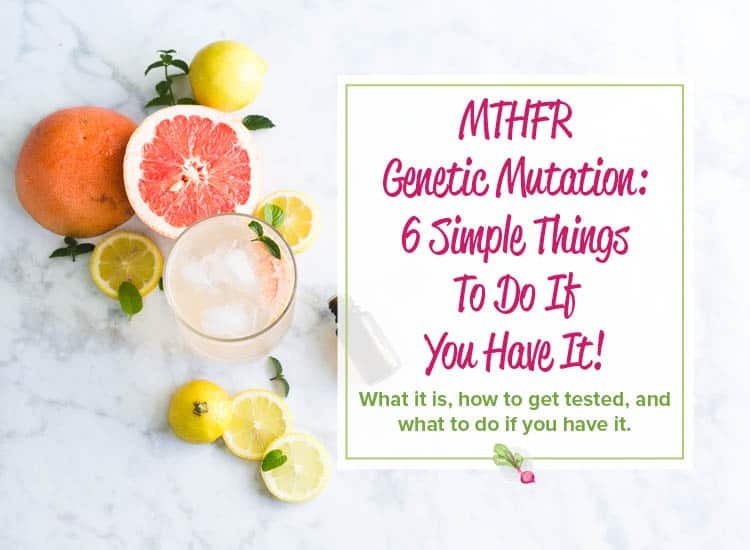 Ultimately, having the MTHFR mutation means you need a little extra support with detoxification, and with getting methyl-folate (aka 5-MTHF) into your body. Detoxification is incredibly important if you have any chronic health issues, so below is a list of simple changes you can make to ensure you’re getting the support you need. Make sure that the supplements you buy are methylated, which means they need to either say “methyl-folate” or “folate” on the label. Folic acid, however, will be difficult for your body to assimilate, so avoid it. If you’re pregnant or considering becoming pregnant, it’s important to discuss this with a practitioner who is educated in MTHFR gene mutations. You’ll get the most bang for your folate-buck from organ meats, but I know it isn’t on most people’s go-to meal plan (writer raises her hand). One way I like to get a daily dose of organ meats is through a grass fed organ complex like this one. You can even use for GRASSFED10 for 10% off! If you want to just supplement with organ meats and eat other folate containing foods, you can stock up on veggies like broccoli, asparagus, okra, artichokes, turnip greens, brussels sprouts, lettuce, escarole, and beets. If you tolerate legumes and lentils (preferably soaked and sprouted) are also a great way to get folate into your diet. Again, it’s important to work with a practitioner to identify and treat a candida overgrowth. If you have mysterious rashes, bloating, fatigue, and a white covering on your tongue that seems to get worse when you consume sugar, ask your practitioner about getting tested. If you test positive, they will work with you to find a protocol that will help you get rid of it. 4. Replace your amalgam fillings. You’ll need to find a biological dentist for this, but it’s worth making the switch! Ask them to remove the amalgam and replace it with composite resin instead. This is a safer compound that won’t release any toxins into your body. And just like anyone else, focus on detox in every way. You don’t have to do this all at once, but focus on eating whole foods (think roasted sweet potatoes instead of french fries, grass-fed, organic ground beef instead of fast food) and organic produce when possible. Switch to homemade or natural cleaning, beauty, and skincare products. When we put fewer toxins into our body, we don’t burden it with getting those toxins out. 6. Consider a whole life detox, or just add some simple detox strategies into your life. I can never say it enough: detox doesn’t have to be difficult, complicated, or expensive. It doesn’t have to make you hungry or have you running to the bathroom every five minutes. Detox your exercise routine by replacing some weekly runs with walks or slow yoga. Practice gratitude for all of the things your body can do, and all the love in your life. Take deep breaths. With all of this take it slow. Be nice to your body and don’t throw too much at it at once. Take the steps above one by one, give yourself some time to adjust, and see how your body reacts to the changes. You are the expert on yourself, so listen. Click here to Pin this blog post! Lymphatic Elixir: Your Daily Detox Drink!